The Arctic Race of Norway (ARN) 2018 will be the first and last UCI 2.HC race to run in Norway’s northernmost county Finnmark in its full length. OK, maybe I could be a little bit less dramatic about it – the county will cease to exist and a new adminstrative unit including also the Troms county further west will be formed. This county (fylke) covers a land area larger than Denmark, so if you can run the Post Danmark Rundt in 5 stages it should be possible to run a shorter stage race in Finmark. However, this is the Arctic - even if it is the Green Arctic, and there are no polar bears and floating ice bergs to be seen, it is a a very desolate place and for road cycling that means there are much less roads to choose from than you would believe. To keep the Finmark vs Denmark anthology going, there is definetly less roads and less interesting roads in Finnmark than on Jylland (the Danish mainland). 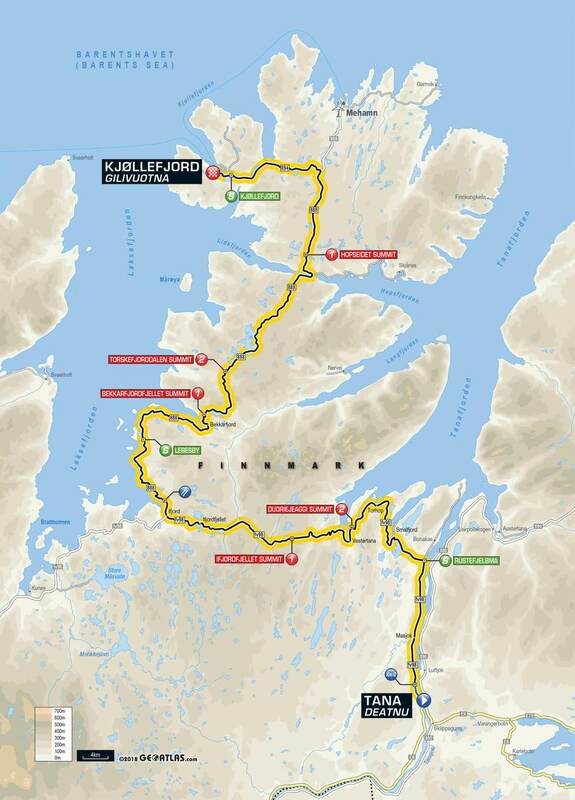 How great to see then that the race will cover some of the finest roads the county has to offer and this includes one of my dream rides, the 888 road along the Nordkyn Peninsula, which they will follow to one of the fishing ports at the extreme northern tip of the European Landmass. (Yes, the race visited the North Cape in the second edition of this race, but that is on an island, how they sold it and got it universally accepted as the northernmost point of Europe, beats me. Stages are scheduled to finish around 17:30 – 18:30 except stage 2 which finishes earlier in the afternoon. I think it is a bit of a pity that there is an overlap with the BinkBank Tour, because this terrain suites the same kind of racers. The first three stages are unusually long for a race at this level, and it is flat with minor exceptions. The GC will have a fair weather outcome (sprinters with bonus seconds will dominate) and an alternate foul weather reality in which at least one of the stages may be split to pieces by the wind. Almost everywhere is wind-exposed in this county and every stage will have potential for echelons if the wind is in the right quadrant. The major climbs are, not so steep and often far from the finish, which is why I emphasize the wind rather than the climbs as a likely deciding factor. However, the organizers seem to see it differently and there are short steeper hills in the finishing circuit on stage 3 and 4, which could split the field as well. With this in mind, let’s look at the teams, and their expected «big names». BMC: Caruso, Bettiol, Roche, Schär, Wyss – who’s without a contract for next year? Direct Energie: ? I can’ see their plan here...just watching the reindeers! Wanty-Groupe Gobert: They bring both Odd Christian Eiking and Guiallume Martin, question is: will they be blown off the road? Should have brought a big belgian along (van Keirsbulck). Team Fortuneo-Samsic: Warren Barguil? On these roads? Another team here to watch the reindeers...Laurent Pichon may be a more relevant rider in this terrain. Sport Vlaanderen – Baloise: They will be looking for a win having none so far this year. However, what is the plan here? WB Aqua Protect Veranclassic Justin Jules must deal with Cavendish but could get a top 3 in a sprint I guess. Delko Marseille Provence KTM: Gatis Smukulis may strruggle on the small hills in the finale stage 3 and 4 but if the wind picks up everyone would want him in their group. Rally Cycling – Leadbelly, can you help me out – what are these guys doing here in Europe? Are they dangerous? Joker Icopal: It looks like they can’t get their team right for this race. CF Hagen their best rider in the spring, but more a climber and this race doesn’t look like his. Herman Dahl may feature in the sprints. 1. The Barents Sea actually covers a huge area of the European continent further north, underwater for the most part, but you can’t go there by bike! Robin Carpenter had a slow start to the year, but he's picked up some form just in time for this race - 3rd on the Queen stage in Denmark and 2nd in Slag om Norg. Usually a pretty aggressive, attacking type of rider. The other two to watch for are Joyce (good finish in a reduced group) and De Vos. Do you not remember De Vos from Utah last year? Nearly soloed to victory on the first MTF. So the talk at the end of last year was about how UNO-X were on an upwards trajectory. For a change it was Joker who were having their best riders poached, they now in essence run the Norwegian U23 team and of course we can't forget the luxury coach with white leather seats they bought, but have their performances and results overtaken either of the other two remaining local teams? Obviously with them being a "development" team you could say it is difficult to analyse their performance over just one year, but what in your opinion t-72 is the local pecking order? So the talk at the end of last year was about how UNO-X were on an upwards trajectory. I can try to characterize what is going on: The Bergen (and before that Hafjell) UCI World Championship was great fun, but a sports finance scandal and the Norges Cycle Forbund is ... pretty much bankrupt As the NCF primarily runs the national teams and that includes juniors and U-23, this age bracket was very vulnerable after the Bergen World Championships. Exit sucesful Norway national coach Stig Kristiansen --> Dimension data. Among the directly affected from the Bergen World Championships bankruptcy was Interspons, parent company for both Tour of Norway and Team Joker - Icopal. They lost a lot of money and their operations suffer from it. It is not clear to me if that was the direct reason for den Ouidenhove's exit or if it was the offer from Dimension Data. In other words, the remaining chief responsibles for the Norwegian succesful junior and U23 squads are now both with Dimension Data. Money (both where there's none any more and where there is some more) must be part of the explanation, cause they didn't do a bad job (2x U23 worlds, good results at Avenir and Aosta, + several classics). The Bergen world championship became a turning point, development of cycling in Norway will struggle for several years to get rid of its financial shadow - after so many years of good progress, it is lamentable the way things turned out. In this situation, one sponsor stepped up as something quite close to rich uncle: Uno-X! Basically Uno-X has footed the bill for everything that is going on except Team Joker and Team COOP. That includes all national teams, UNO-X Hydrogen development team, and also the resurfaced Team Ringerikskraft U23 (one more team out of the same clubs ) I think everyone a little interested in Norwegian cycling are very thankful for this. Now, the team itself: they have labeled themselves a development team and if you look at the riders listed for this race, they need to develop and they will probably measure themselves on how they develop and not the results they get directly. It is not the team's best riders, but they are on their way. Speaking of development - in this race we will see the first "delivery" from development as Anders Skaarseth will be racing for Cofidis now. A good allrounder and a team member more than a captain perhaps. Meanwhile, the best team will ride Tour de'l Avenir (with on and one rider, as team - on a parcours that fits Tobias Foss better and that is perhaps the team's primary objective this year. In terms of pecking order, I think that will be , , for this race. has their best riders, whereas the two other teams miss theirs due to Tour de'l Avenir. I am working on stage 1 preview, but I have noticed there are a few updates on the start list: Mark Cavendish won't participate and same goes for Omar Fraile, however, he's replaced by Chernetskii who actually may be a candidate for winning the whole thing if Fuglsang doesn't want to. He's the kind of rider who wouldn't mind winning one more Norwegian stage race. Long term sponsorship deal with Norwegian energy company Equinor secures funding until 2021. Odd Christian Eiking named as captain on the team presentation. He's got a 5th and a 6th place GC from before, and may be able to improve it - if he's not blown off the road on a windy day. 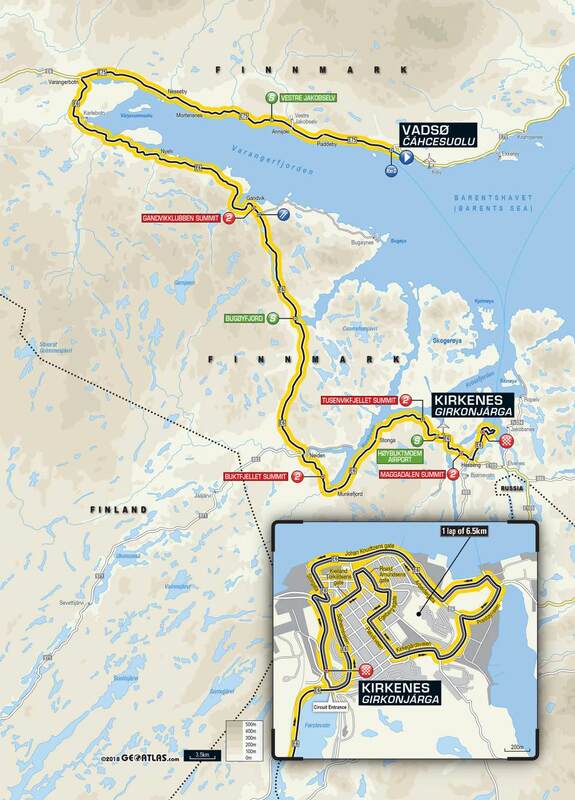 The final is a lap through Kirkenes, with several sharp turns it might actually stretch the peloton a little and favor a solid team delivering their sprinter ... wait, they're not here ! I expect to see in the break , , with , and battling it out for the hilltop sprints with CF Hagen. Stage starts at 13.25 CEST and finishes around 17:45 - 18:15 depending on the wind..The final 30 minutes should be good fun. PS: There's another Norwegian stage race on a little bit earlier in the day: The Ladies Tour of Norway. I can't find the time to write about both! Yep...the Flying Dutchman stamped his authority on the race from day 1 - this finish is basically head and shoulders above the rest. Notice also the entanglement near the base of the final hill, there is no 3-kilometer rule due to uphill finish (!) so this will effectively cool down a lot of hot GC hopes. However, this stage was really worth watching - despite leaving work early to catch the sprint I turned on the telly just to see van der Poel cross the finish line, some 15 minutes ahead of the fastest schedule. (!) I decided I could just wait for the recording to come up on the streaming service and started watching from kilometer 0. It's just 4 weeks since I was on the same roads for vacation purposes so it is kind of nostalgic with a look back already. And, racing-vise this was not an ordinary small stage race stage with a sprint at the end. This is what I saw. A large group of some 20 + riders headed by Katusha with Thiago Machado but with almost all teams represented, escaped already at the first intermediate sprint, some 15 km from the start on a 184 kilometer stage. The winds picked up on the exposed coast along the Varanger fjord and the rest of the peloton split into 3 groups, making the race a race between a total of 4 groups that were playing accordion on the time gaps for some 100 kilometers: waxing and waning with a maximum stretch of around 2 minutes from the front group to the second group. Eventually, as the route left the coast and headed inland there was less winds and the rear 3 groups merged back and started a somewhat better organized chase, but only catching the last of the breakaway, Anders Skaarseth, after the first lap on the finishing circuits. Skaarseth subsequently helped chase down the late attackers, and earlier in the day he won the climbing jersey (THE INFAMOUS 500 KGS OF SALMON JERSEY!) In other words, should get the permanent contract ready in no time, or some other team will - it seems like the development is already functioning just the way it should. (He is currently on a stagiare deal with the red horde ). It was a stage race stage raced like a classic, in the final there were no sprint trains although tried to no avail - too many tight turns to get a large carriage going and ideal for a cyclocross king of repeated accelrations. I look forward to this stage because I have wanted to ride this exact piece of road - the 888 - myself, since the first summer I came here in 2014. I just never find the time to bring a car with a bike up to Finnmark (it's about as far away from here as the Alps...). The only difference is the last little bend in the road, I would continue straight ahead to Mehamn instead of going to Kjøllefjord, but that's details. As mentioned in the top post, it is very hard to get much further north on the continuous European landmass by bike. Yet, this landscape is full of contrasts and the race passes what is probably the northernmost active farming community in the world in the green Bekkarfjord and onto the barren Arctic tundra of the Nordkyn peninsula just a few kilometers later. Back to racing, I think this stage has two faces: it has the most climbs and most of the longest climbs in the race, so some may see it as a climber's stage on first glance. An estimate of 4000 m climbing total is circulating in the media but I don't think that is anywhere near correct. This is neither the Alpes nor the Ardennes. Those climbs are fairly moderate and they are a long way from the finish. After the climb up from sea level at Hopseidet, there's 35 kilometers of flat, slightly undulating and then descending into Kjøllefjord, where the least challenging final 5 kilometers of all the stages in this race is waiting. In other words, even though it doesn't look like it, this stage could be one for the sprinters, but the sprinters that can handle a few medium climbs. Another scenario is of course, the wind could break it all up in those final 35 kilometers and a strong team like BMC could split the field riding echelons. I have checked the forecast and it seems like there will be >10 meters/second from SSW tomorrow. And then there is the road: For long sections on the tundra, the road is built so that it is exposed to the wind, on purpose - as that helps reduce the need for snow clearing in winter. I think there will be some sailing going on tomorrow, maybe even more than we saw today, and this time not from the start but near the finish. Something needs to happen with the wind, because I don't think the parcour alone can repair much of the damage caused to the GC by yesterday's finale crashes. I don't think the race is settled just yet. Yesterday's stage was raced unexpectedly hard (finishing way ahead of schedule after lots of work in bordures) and some teams must have quite a few riders with tired legs already, so and (chase managers all day yesterday) may opt for a stay-in-the-bunch strategy today. However, someone is going to go in the breakaway, and if one or all of the WT teams can sneak away with one or more riders - or even if a large group goes like yesterday -does anyone really believe Corendon-Circus will be able to control it on behalf of the bunch? I mean, it is a conti team with taste for mud and they're not all on MVP level. It is essential for Corendon to position themselves so that at least one of the big teams must contribute to the chasing or they will burn out every match they have leaving van der Poel exposed long before they get to Kjøllefjord. EDIT: one unidentified Aquaprotect rider and August Jensen also effectively shoveled off the road by the wind. Given that Jensen is usually faster than van Winden and van Winden finished 2nd in the sprint, this instability probably cost Jensen the stage win he wanted so much. Jensen was interviewed after the race, had quite modified clothes, a cut on his leg and lost some skin here and there, so I guess he won't feel too good for the rest of the race. We also saw Guillaume Martin falling in the same curve as Jensen disappeared off the road. On the other hand, the rider named Dennis van Winden might actually have been destined to do well on such days. Another quite dramatic stage from start to end (maybe a little more quiet in the middle.) Race LEader Mathieu van der Poel covered too many attacks on the first 2/3 and blew up on the decisive final climb up from Hopseidet, when Fuglang sat a high pace for his teammate Chernetski. Only Bettiol managed to follow, but an intermediate chase group was midway down to van der Poels group after this climb and eventually managed to close the gap to the top three in the final kilometers into Kjøllefjord. From your review it seems clear why Mathieu is not interested in road cycling. It seems like he approached this stage as a 200km long cyclocross, all out right from the start and running out of fuel in the final climb. It's the illustration of his own opinion that staying in a peloton for 5 hours is too boring for him. He's gonna keep crossing and MTBing for a long period, I think. Sounds like a fun stage. How many km out should we start watching? The stage had start-to-end action so, yeah, it all depends on how much time you got. I would say the last 50 km is a minimum. Although you'll struggle to understand why van der Poel wears out and some other tactical important points, the final outcome of the race is really created in that part, especially the climb out of Hopseidet. This time, I think we can finally have a more 'quiet' stage. Although most of the route is thoughly wind-exposed, both the early Porsangerfjord section (kms 16-91) and the late section on Kvaløya from Kvalsund to Hammerfest (kms 140-171) is more or less completely open to the winds and it is not much protection elsewhere either. There are a few climbs to concentrate on, firstly there is the infamous Nordkapptunnelen: if you look closely at the profile here you may notice that it extends below 0 meters and this stage actually goes about as deep as it goes high. The climb out of the tunnel is the hardest in the race and is rightfully assigned a 1st category - the descent down into the tunnel, if I recall correctly, is the reason why Marcel Kittel will never race in Norway again. It might be a good idea to put lights on your bikes, dudes! (On sportives here it is mandatory.) Going down fast into the cold, dark tunnel is scary enough with lights, and it is required if you want to get those points for the salmon jersey on the top of the climb back out (looking at Sindre Lunke). Right...so there will be a breakaway with mostly good climbers and they will just have to keep pedaling...pedaling...can we say pedalong(? )the beautiful Porsanger Fjord, over the Hatter climb approx midway (another not so dramatic one)...down to Kvalsund and along more fjords into Hammerfest. There are a couple of rounds on a circuit in town before the finish line, and it includes a few short climbs which will at least be selective and possibly may be decisive for the race outcome. The longest of these climbs top out at 136 m above sea level, they are going up there twice, doen to sea level and up a smaller hill at 67 m.a.s.l.. This smaller hill is also the finish line location. In the context of this race, that is a lot of climbing in very few kilometers. This part will probably be all the action today, but worth watching, even if it is hard to prioritize among all the races going on this weekend. This stage is one for the puncheurs, but it is also one for the GC riders. It is very tight for the top 3 with only 6 secs splitting Chernetskii, Joyce, and Hoelgaard. Team Joker -Icopal is definetly on the offensive and announced that they will no longer be chasing stage wins - they are going all in for the GC. That is not just a little offensive it is overly ballsy as Chernetskii is very good on these short hills and - he's got a world tour squad to help him, whereas they are a conti team. Another team challenging, although outside the top 3 GC currently, is - they were everywhere yesterday except on the podium, which must have been disappointing. Alberto Bettiol seems to be their main man both for stages and GC and I think he'll continue to challenge despite a disappointing finale yesterday. It seems like has brought the best team, but brought Fuglsang and he makes all the difference. Holst Enger used to be quite good on stages that required some climbing and finsihed with uphill sprints before joining but with the Israelis we have only seen him as a flat-land sprinter. August Jensen would probably be their candidate today, but with the bruises he had after yesterday's fall I sort of doubt he will have a good day today. As for Eiking, he's got a saddlesore problem and may just as well withdraw, but he's still in the race for a reason and that may be today's stage - it is definetly made for riders like him. Yesterday he had to pedal standing up as often as the wind would allow him to do so. 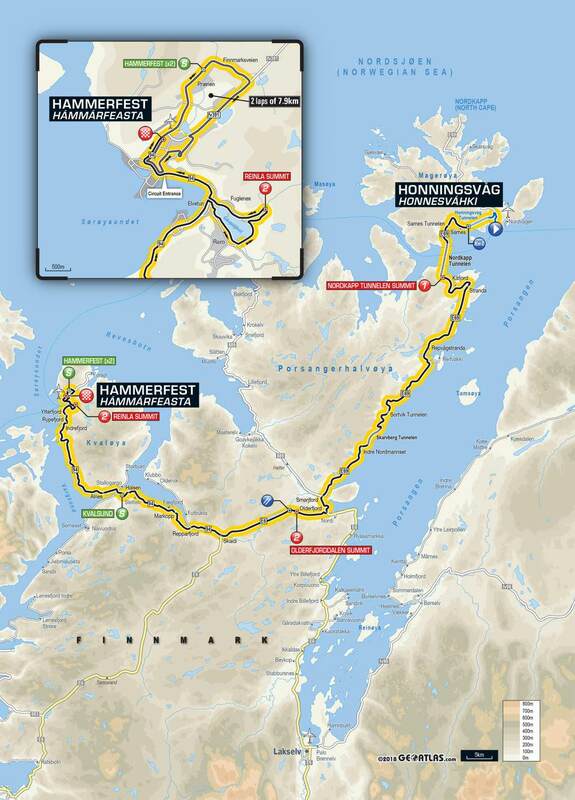 Today's stage ran almost as predicted, break established early, smooth riding (fast, but not crazy speed) all the way to Hammerfest and the final laps on a local circuit there, featuring a couple of hard climbs and some narrow cyclepaths, quite similar to the Kirkenes finish - but a bit harder. I think I also wrote that this would be a GC stage, but I didn't extrapolate from there to "if there are no GC riders up ahead, Astana will be perfectly happy to let the break go in" and it seems the other GC teams also waited to long to realize they had been tricked. These twisty, turny, technical and hilly finishes appears to be exactly the reason why the Corendon road team exists. From the break Adam Toupalik was in total control, looking back to see if kapteijn van der Poel was on the way up both at the bottom of the final climb and at the top, before he rolled over the line in 1st position. Van der Poel finished second, but if Toupalik had waited - it would have been a close race and they might actually have lost it, so it would be unfair to blame Toupalik for lack of loyalty even if the results look a bit strange. A visibly tired Chernetski was given an armchair ride by his team and he returned the favor by taking the last bonus seconds and blocking Hoelgaard who may be his main challenger. The time gaps are still small, and tomorrows stage will be a thriller. While all the other stages have been long ones, here comes a short, intense stage for the final day of the 2018 Arctic Race. From Hammerfest they will move back a few 10's of kilometers to Kvalsund. 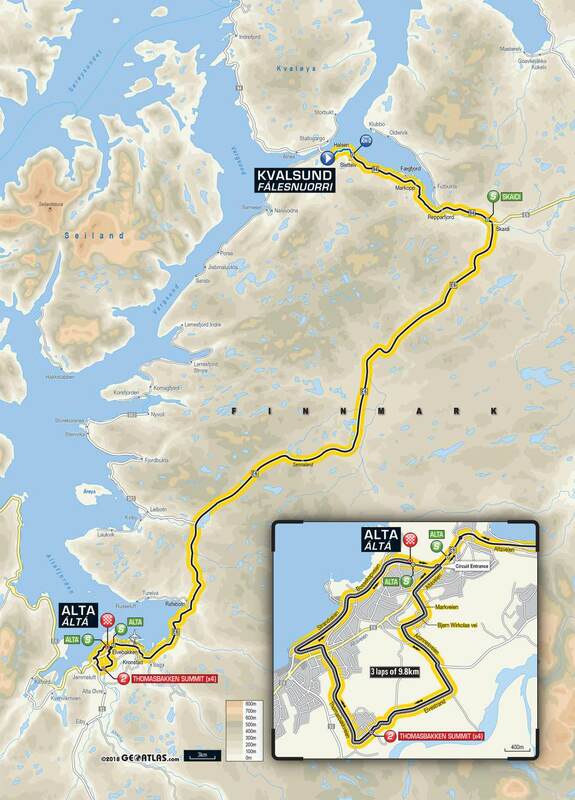 The stage will start with a longish false flattish climb along the Repparfjordselva ("elva" = river). They will go backwards the same way they came yesterday to Skaidi (riversmeet) and from there they will take a soutwesterly course along the river, climbing slowly up to the Sennalandet plateu, descend to Rafsbotn and race into Alta, where (once again) some local laps which are technical, twisty and hilly awaits the peloton. There are two sections of this course that can split the peloton: Sennalandet and the local laps in Alta. The weather forecast is for a quite horrible day with rain and galeforce winds. This is supposed to be the same rain that fell here in Bergen today - in which case it is a lot of water, but to the east of the Lyngen Alps the Southwesterlies are often not so bad (the area immediately east of Lyngen is one of Norway's driest places, and Alta isn't that far away from there.) Anyway, it can become a fould weather stage like we haven't seen in Norway since Tour des Fjords 2016. Winds are predicted to come from the WNW and the race course for the most part heads SSW so this will be exactly..crosswinds. And rain! 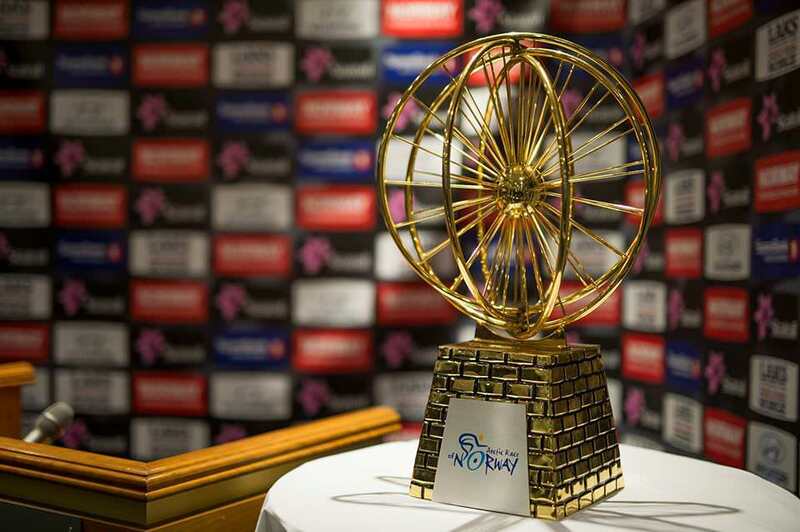 The race is now Astana's too lose. They have been doing well on the 2 previous crosswind stages but BMC will challenge them once more. The more unknown factors (compared to Astana) is and - can any of these "small teams" break Astana in the crosswinds? It would be sensation, but it really feels unlikely. However, my impression is that Astana are stronger in the climbs than on the flat, and Chernetski has been riding on the limit in the crosswinds a few days already, and looks really tired at times. However, he has a GC victory in the Tour des Fjords already so he should be relatively comfortable riding in the rain. Hoelgaard doesn't have a Tour des Fjords victory, but he has grown up cycling west Norway, so he'll probably excel in this weather. Colyn Joyce comes from Oregon and shouldn't be a stranger to wet conditions either. If Astana can put Chernetski into Alta in the same group as the other GC riders, Chernetski should be able to defend his lead as long as he doesn't fall or get into technical trouble. He is better than Hoelgaard in the twisty sections. However, the best riders in this kind of Arctic finishes wear Corendon-Circus shirts. OK, a wrap-up post is called for, I believe. Today's stage was raced in a more disciplined manner than many had hoped for. The wind at Sennalandet didn't quite come from the right direction (a little bit too much from the front), not very friendly for neither attacks nor echelons. When the race rolled into Alta it also became apparent that the small hills in the finale wasn't really hard enough to split the peloton - and again we saw it took a while before any of the other teams realized Astana had no interest whatsoever in reeling in the break. After a while Direct Energie moved to the front and upped the pace, later followed by stage favorites . I guess Echoes is going to burn me over open fire for this, but the way Mathieu van der Poel is winning stages here is a bit Saganesque, including having his big brother to reel in the break. The pace was so high it was clear to GC challenger Hoelgaard he could do nothing except wait for the sprint. The uphill sprint opened by Nicolas Roche in a way that was reminiscent of his win on the Finisterre, but without the stamina that he had back then. It turned out to be a perfect leadout for van der Poel. Sondre Holst Enger did not get on board the Irish express and had to lead himself out up the hill. In the end, he could do nothing to catch van der Poel but without Roche's unintentional leadout he might at least have come closer. There was nothing unfair about van der Poel's way of winning, he actually beat a thoroughbred road racer in positioning for the sprint - something he seems to have practiced more than controlling a crosswinds stage. Hoelgaard and Joyce were unable to threaten Chernetski in the GC. A split actually gave Chernetski 4 secs more in the final GC. This makes the Tour of Norway the only Norwegian UCI stage race he hasn't won. With this strong Russian a favorite in all Norwegian races, let's hope that the next time they are racing in east Finmark, they can race in Nortwest Russia too. Murmansk is the biggest city up here and although relations are never very easy with the Russians, but a bike race would be a nice way to improve them. The race organizers really wanted to go there this year, and they will probably try again. Sending the governor a few pictures of this year's worthy winner can actually make that easier. Arctic Race organizers: they are the best (I might even write a separate post about this later). Eiking and Jensen - the two presumably best Norwegian riders here suffered from "bad luck". Barguil - same as above, except French..
Great coverage of a great race. If only I'd had the time to watch it - but I was busy with the Ladies Tour of Norway which was possibly even greater. But the Arctic Race is in my 'to watch in winter' folder.